Daddy had school today - and they had agreed last night she could watch a certain movie about Kung Fu style fighting as she has been practicing with a staff on her own to try and needed to see more 'material'. --They researched palette knives like are used in the Joy of Painting episodes, and other supplies. They looked at and bought heavier weights for her weight lifting set. 1.45p - Movie: "Legend of Drunken Master"
She is downstairs playing with the Speak and Spell now, which we had finally gotten batteries for after they had come to town to get me at work. Mark watched the outtakes to Drunken Master with Esme, too - and proved her these were real people, who make mistakes, and get hurt - and they also helped each other out, laughed etc... We got Big Hero 6 and she has watched that twice. I'm trying not to get a sinus infection and spend some time sitting in bed knitting a new pair of socks. ----I used the net boxes from Math Salamanders to cut out lots of geometric solids, some of which she helped me put together - or compared, talked about features of etc. She really 'gets' it. We cut cones from construction paper - that she found hard, because we started with no pattern. Then also with no real pattern - we cut out a cube box and a rectangular prism. She started to fuss that it was too easy yet too hard for her to do it..we did it together, and she understood the fundamental of what we were doing --then she thought it was fun and worthwhile. We went downstairs and made a pinata in the shape of a pyramid. I showed her the process for cutting a square out of a rectangular piece of paper, and we compared the triangle from the pyramid to see if all the sides were the same. Then, I showed her how to make an isosceles triangle out of a square. --she helped us shop for the first time in 12 days....we had a lot of things to get. Her attitude was very good. --There is a lot of cooperation, thought and learning in this - she sees us all work together, we make decisions, she asks questions and we answer... we pack things in the cart and back out of the cart - she also counted her own change at one store and bought a small toy with her allowance. I promised if she did hard math with me for an hours time she could 'present' Goat Simulator for time in school today. She said that would be her 'perfect day'... it turned out more like a course in anger management and finding our zen balance. 11.30a - Kahn academy math - practiced all early math! -----I promised some 'easier' picture math after she did one more mastery exercise in Kahn. --She showed me what each control does, what the powers of different goats are, and her favorite places - also where some of the powers are got and what the process is to get them. ---Spelling mastery article #5, 16 words spelling - 'were' and 'said' made her mad because they don't follow rules the other sounds do... that was my problem as a young reader, too. 3:45 - anger manageent - there were lots of other things going on and she wanted us to do the project for her... we talked through and completed the circuit. We tried to get to town, leaving Esme at Grandma's house. The county road is still too slick on the hills and we can't get over. Getting over is half the battle - you have to get back. There is another snowstorm predicted tonight... we'll see how this all goes. // She has been learning from the Joy of Painting episodes! She did great color mixing and put different color shadows on both sides of the mountain, one for shadow, one for sun rays. I painted, too - on another sheet.. and made a few things. I had her present her painting in a tablet video but the sound was really quiet. I told her for school we would work on making better videos. 1:30 - Minecraft design and exploration by herself, she went back to Horse City and built other things in several of her worlds. I limited her to one hour or this. Note : We are still iced in. The mailman stopped by and said we would likely not get to the highway today, either - the main road is cleared but our hills on the back road are glare ice. The Rhymes and Poems book I had ordered the other day did not come - instead, I got another volume in the series - 'Places to Know'... not really what Esme was interested in, either.. read her the first few pages anyway. I told her we would study those a bit more and then test her out on it. Daddy is trying to rest up from a cold - doing that hydrant in the cold rain the other day. Columbus, the puppy - is getting quite spoiled. We still have a glass-like surface of ice all over everything. That short melt we had the other day just wasn't enough to do the job...it froze back even slicker. It doesn't look so bad from here, but that glass-like surface is there. Mark measured the roof ice at almost 2 inches when it came down briefly yesterday. 9.30a - laundry, operating washer and dryer, she needed and wanted to - so it was a great time to introduce it all to her. She can reach all the buttons if she stands on the dog food container, which she did! --------Had her draw out a figure as well that showed the clothing and colors in the sheet. 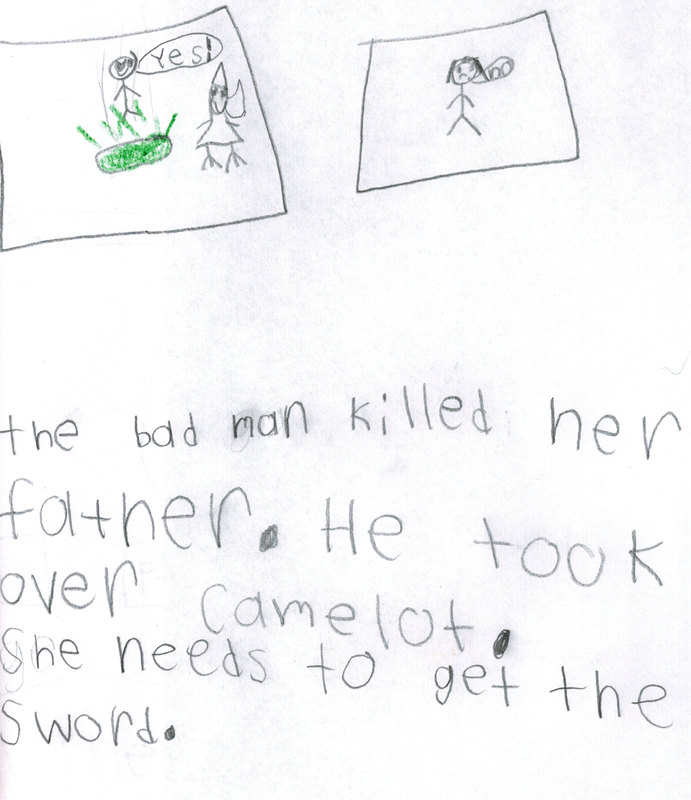 ----She had wanted to count watching the movie for school, but we said it had to be more than that - so after the movie she did an hour making three pages with drawings and writing, and a cover. I counted this as spelling too, as she had to ask for words she didn't know and copy other things like 'Excaliber' that I wrote for her. Spelling : K12 reader list of spelling words We are using the first grade spelling words as 'spell it from hearing it' and the third grade spelling words as vocabulary and copywork. I have a 1968 spelling primer 'Language Mastery Primer' that I bought at a library sale we are using, as well. We picked up a 1.00 dictionary for her to learn to use, at the same place. 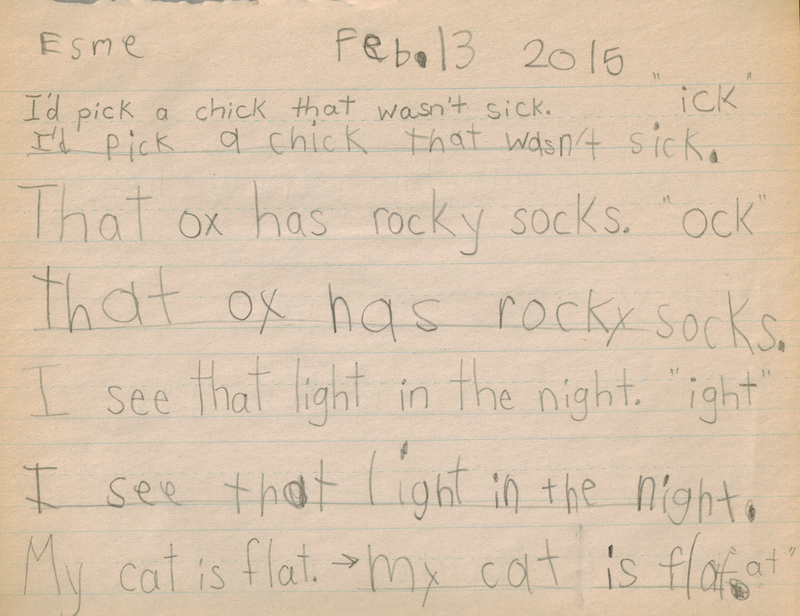 Reading Comprehension : k5 Learning Reading Comprehension This is a hard one to find something simple enough for her writing ability but tough enough for her logic capability. She can read a lot more complicated items, but her handwriting still is a barrier at times, and she is just beginning real composition. We have a book from the Calvert school that Aunt Dot sent to us that has lots of fables and questions in it - we've used that, and also some of the poetry from it for copywork. Reading - books, poetry and rhymes. plurals, tenses, etc... too many to list, but we are active in searching out books to introduce her to, read with her, etc etc...I have bought several 'old school' textbooks that are on her reading level, and we've read them sometimes when she doesn't have something else she is 'into' and we haven't finished. She has her own library card now, and we have went often. She likes the chapter books from Franny K. Stein and also the Stink Moody series, they are fun. We've read some Charlotte's Web, and I have Half-Magic and Little House in the Big Woods on reserve, but I don't want to start more than two chapter books at a time. Handwriting: 'the quick brown fox jumped over the lazy dog', for copywork, mixed with other sentences and copying names of dragons, etc.. She has a perfectionism tendency...but once in a while she lets me correct her and I do see her improving steadily. Math with : Khan Academy, Matific and using specific games online that make her think about math while she is playing them - multiples, scarcity, probability etc... She has done the Dragonbox algebra prep for age 5 and up from start to finish. We also downloaded and used Math Stretch as a mobile app and some calculation apps for basic addition/subtraction. We started with multiplication tables up to 10x10 earlier in the year and very simple division with fractions (circle pizzas) and regular numbers (counters/word problems). Still working on the 11/2 is 5 and a half TWICE... maybe find some materials for that or make a prop to help. Asking questions and finding answers - researching for information, creating tests and recording the results. Started with the Chemistry cards at Pinay Homeschooler, introducing them 9 at a time (page) and talking about them. She is picking up on the ideas with the pictures and categories much better than she did with just the letters. We have done lots of experiments, ones she found online and some we got from a Lowes kit, oobleck and such. For nature science she is learning a lot about different animals and environments, how to prepare and care for different pets and animals and learning about plants with her greenhouse. When it was warmer we went for lots of nature walks around the house and answered her questions as they came up. Started her out playing World Explorer map geography game at the library. She didn't really believe all of these other places could be real at first - thought it was just stories. We have three hallway maps, bought and from National Geographics. We are using National Geos and youtube videos to investigate different places, the animals and people who live there, as well as tectonic plates, volcanoes and etc... We printed out a map from Printable maps and put it up on her wall, for us to fill it out and color it in as we learn from the other maps. We had her watch Liberty's Kids from start to finish, and have talked about history in general, where people lived, where they moved to, Columbus discovering America, wars, Indians and the settlers - taking little bits as she is interested in them. She has played the Civlization game with me and it gives some good ideas that people had to learn things slowly etc.. I think once she has a better idea about the world in general- from our geography studies and relating those studies to history and people, she will be ready to take on more lessons. Languages: She did a little modern Greek online at the beginning...waned off of that and it became too much of a chore. She agreed recently she should go back and learn it some more. BUT - she had remembered several words all this time! Photography, Video : She has used our smaller camera, printed out the photos with me at the store - and is learning to take photos and video on the tablet. Computer interface: A lot of the games, Minecraft, PBS kids etc that she plays fall under this. She is really good (and has been for years, really) at figuring things out to play complicated games. Now, she is learning from them, learning how to look things up about them and really getting into them for strategy and quests. simple cooking with Mom and Dad, measuring etc. cleaning up after herself, putting away clothes, organizing desk etc. Books from The New Basic Readers collection (several years ago), Fun with our Friends etc. -----There are two other similar books 'Up and Away', and 'Seeing New Things'. That last one is a science book. They were both from library sales. Pets and Promises (1980 primer book - listed as 2nd grade level 1) , seems more difficult than the other one. Books from the 1979 Childcraft How Why Library - we have four now, one from my original set (Indian Book), the Story of the Sea, Things we Make and Rhymes and Poems. Probably will add more as we go. A book called 'the Car', on the history and construction of the car, also car racing. A topographical map showing mountains, volcanoes and ocean currents. Seeds for her gardening projects, dianthus, cockscomb, geranium and herbs. A few thoughts and articles about homeschooling. Why Schools are Failing our Boys - and girls! I will say that many of the reasons they give were also our reasons for pulling Esme out of first grade. It was crushing her spirit and creativity. AND, the school thought that was a good thing, because it made her easier to control. It was NOT a good thing, and making her 'easier to control' was not our goal as parents. Teaching her about the world and leading her to use her own brain and make decisions, good judgement and ideas for herself is our goal. We would also like to show her the benefit of hard work and allow her to do the more 'questionable' things that kids her age could do even back when we were kids - that they can't now.. play outside, jump in mud, make and light candles (with supervision), use hand tools (again, with supervision). She is ready for these things with us as her guides - and she will appreciate the idea of being an adult much more if there is fun and learning involved with the adults in her life every day. Role of Rigor in Kindergarten (Fred Rogers) - a great article about the role of art, music and imagination in childhood..and how we seem to be losing that in the modern public school system for more and more testing and worksheets. About our own school method. I saw in a book somewhere about the 'retelling method' of learning. The child learns something, and later, they come and tell you, or someone else - just what they learned. They get to reabsorb the information, frame it, see reactions and maybe get extra info from the other person. We've been doing this naturally with Esme - but I am doing it more consciously now. I will have her tell Grandma, or tell Daddy something we did earlier in the day. One, for her to remember it. Two, for her to reframe it and try to get the relevant bits out of it (good for her language development) and Three, to reinforce that it was a valuable thing to learn and that other people will think so, too. One of the things we have been having her recite is the 'Thirty day hath September' poem - and I've put it up on her wall above her calendar. This is to attempt to put an end or at least a method to the 'how many days until (holiday or date)' question she keeps asking me. Now she knows how to add double-digits. Now she knows how many days are in each month. Go find out. /haha evil supervillain laugh... but it's working - we don't tell her 'I don't know'...or 'it doesn't matter'.. we say if it matters that much, here is how to find out. Esme and Mom ready for outside. We tried to get into town, but ended up having to walk back to the house (little over a mile or so). The truck slid down into one of the ditches and there wasn't any structural damage, thanks to Daddy's quick thinking. We had bundled up really well in case that would happen...and Esme had refused to stay back with Grandma or such...she thought she could handle it. She was a trooper on the way back - and kept a cool head while we were sliding, too. I called the wrecker service and Mark walked back to meet him and bring the truck back home. It looks like we are snowbound until the weather warms up. Things could have been worse. Esme says she likes summer now, not snow - so she understands why Mom and Dad say it is dangerous and why we worry when there is snow. 1:30 - return to dragon city (1 hour waits for some things), investigating the 'strength' and 'weaknesses' in the combat part of the book.. who fights with which power best, and is vulnerable to which other powers - investigating how to breed some of the dragons she sees in the book. 3:45 p - opening new supplies, saw water currents on two of our hallway maps! Car book came! This is our 'work in progress 'map, made of printer paper taped together, and little bits of tape flagged for the countries we have looked at and she is "tested" on identifying. I add a bit more each time we find a new place. The blue push pin is where we are! We have three hallway maps - one 'arctic circle' centered, one full world map political and a new one full world topgraphical with ocean currents. //notes : The chickens like cabbage, and the corn from last year seems to be okay, they are eating it as long as we don't give them it every day. So our flint corn isn't entirely to waste, either. Esme is now having interviews on the tablet with the dogs, and videoing birds outside, as well. We threw them some cracked corn earlier and they are greatly enjoying it. caution, there is a loud dog bark noise in the middle..
//There were a lot of words here she didn't know. She looked up how to make different rat toys, and discussed why her room would be a better environment for a rat than a bird (she has no direct sunlight in there, and birds need that to be healthy). We think her engineering talents could be useful for making rat toys, tunnels and etc, as well. Daddy has found an aquarium he will help her clean and make a wire cage and tower on top of. //I went downstairs and made corn flatbread while Esme used minecraft wiki to look up the things she wanted to do, make withers, enter the nether, fight the ender dragon and so forth... I want her more comfortable looking things up and finding her own answers. Will probably read some more Stink book before bed tonight. Still wondering if we are going to make it out to town tomorrow...or if the snow on the road will be too thick and ice for us. Esme's attitude was somewhat better, today - she did the spelling test and got started for the day when we asked..and even though she initially balked at the dictionary she found four-leaf clovers tucked away in it and that made her feel special and lucky. She also found the foresection of the dictionary has cool topics like 'ecosystem' and 'vitamins' she will want to look back to. She put a bookmark in there. 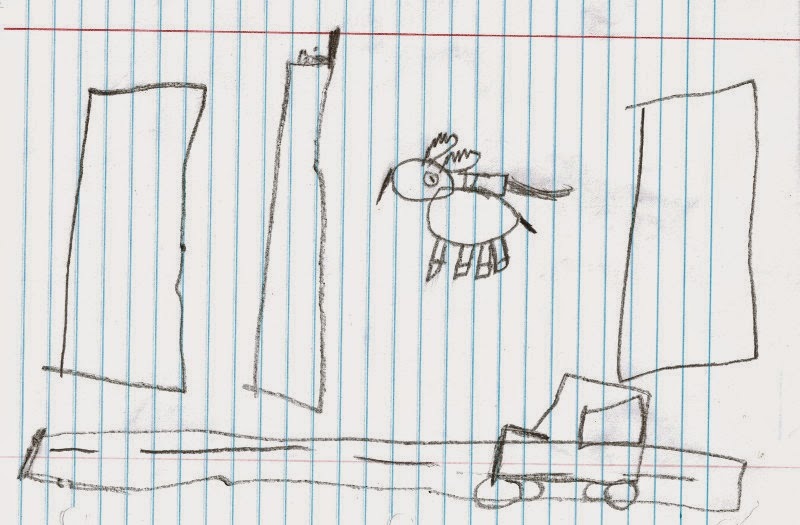 Esme realized her 'diary', a composition notebook, had a times table in the back of it. There was a point, although I forget when it was, when she was asking me questions and I was shooting them back at her - with equation additions.. like - What is 8 x 8 plus two? Math happens on the fly here, sometimes. I realized that the multitude of knitted things I make are being put to good use this week. Things take forever to dry even though the air is dry in here... We let the chickens out early in the morning and brought a package up to the mailbox. Then, when it was time to feed the chickens later, it was nice to have warm and dry gloves and scarves to rely upon. Every time I look at the bag stuffed full of things by the door and think 'way too much'...I should think about this week. 10.45a - spelling test - 16 words, 'acks' were a bit difficult at first. Not counted in much of the school times, but counting for us for the week is the Stink Moody Frog book..she really does like to read about him, he is funny. It is a good reading level for her. Amazon places it Kindergarten through third grade. This is book 8, by the same author Megan McDonald, as the Judy Moody series (Which she didn't really like) And, there are lots of figurative language, onomatopoeia and sarcasm for her to encounter, that she hasn't dealt much with before. She really likes the comic book frames 'Stink' draws. I still want her to read the Little House books with me but for her fun-seeking jokester attitude this is a good series. There was still snow, and we were still going nowhere today. But, Esme was becoming listless and ornery about 10 am ... so we decided to do school today, but do it slow. There were lots of grumpy times - mostly because I wasn't doing exactly what she wanted and I tried to hurry her to feed her chickens. She was lolling in the bath and there was no more hot water. She didn't speed up and Daddy did it while I was still fighting with her about clothes to put on to go back outside. She did come back to center a bit later - she probably started out on the wrong foot having a corndog for breakfast (her own cooking). Thus, I didn't press her to eat anything else 'big' later. We snacked instead of making lunch anticipating a heavy spaghetti supper with garlic bread and possible baking. Baking lemon cornbread cookie sheet with me. Reading another chapter in the Stink Moody Freaky Frog Friday book. We ended at 7 pm. Baking with me the recipe listed below. and ended up never taking it off again after she came in the last time. --we had no anise seeds, or lemon zest , or almonds - all of which was in the original. --We made do, and it turned out great. 3 tbsp of room temperature butter or fridge butter slightly melted in microwave. Preheat oven to 350 degrees, grease a sheet of aluminum foil with coconut oil and set aside on a flat baking sheet. beat the butter and whole egg together in a larger bowl. Add lemon juice or zest - we had no zest. Mix in the flour mixture in small amounts.. may add a tiny touch of whole milk if needed to combinen all ingredients. It stuck to our beaters really badly - but we used a spoon to get it out from between the beaters. Spoon batter onto the aluminum baking foil and press down as best as possible into a flattened ball. Spoon on egg white and start to smooth mixture out to the edges until mixture is 1/4 inch thick or so. It was amazing how easily the mixture began to smooth when the egg was spooned on to it - it felt like a whole different batter. Sprinkle white sugar (optional mix some cinnamon in) over the egg wash. Sprinkle ground nuts on to mixture and other toppings (like dried fruit, baking chips etc.). It snowed, sleet and ice. I stayed home from work - and we gave Esme a snow day. She was awake at 6:30 and I kept her in the house as much as I could until 9 am.. when she just kept popping out the door every five minutes to make sure I knew it wasn't cold outside. Bundled her up. She played. The dogs played. They all ran around the yard like giant hopping rabbits chasing her about. Minerva and Sweetie were rolling each other around in it like puppies. She threw 'glitter' snowballs, because it wouldn't hold together at all. She tried to use the sled and had forgotten how to use it - momentarily.. then she was at the top of the hill paddling like a pleiosaur down the driveway. I just couldn't bring myself to go out there - so cold! Mark went out for a few minutes, and came back in freezing after a short trip down the hill. Now she is playing more games after having built a robot with K'nex. She is trying to solve where the batteries are in goat simulator and where to put them. I think she just got it. Have to think about if we're going in tomorrow...the roads won't be any better, and there might be more weather on the way. If I'm home tomorrow and can work up the ambition.. maybe make this: Corn muffins with peanutbutter or a recipe out of one of the magazines I have for lemon cornbread sugar cookies. Quote from Esme today: While I was playing CIV she leans on my shoulder and sticks her hand out palm-up to me and says 'Do we really need this war, Mom? I mean, really need it? Can't you just stop this and go home?' The moments. She played it quite a bit on her own later, including battles... but just can't help writing that one down for her for later. Covering some word elements in handwiting before the spelling test. //I made her take a break before she could do the dragon stuff, specifically because she had made such a guff about doing those problems. She was appalled, but took her glass tiles downstairs and noisily played and came back proclaiming her bad mood was done. 11 - break - Daddy had just pulled a pork roast out of the oven. Lunch! //she had to ask where the drawer pulls were and look for the word 'tile' to find the tile dept. //we bought some pulls for her top drawer and some octagon and square tiles. 1:30 - library, shop for books, play with younger girl, 'Twisteroo' against me, a game where you copy each other like twister but you take turns on the rug showing the move and seeing if the other can do it. ---there were eight to ten kids there - she had a blast, and there were several disputes solved where an older girl was scaring some younger ones. Esme made a group to talk to her about it up in the slides - she told me this later on the way home. They all agreed it was just play but it was scaring the other little girl. She bought a Human Body and a Pokemon book at the library. We checked out one book for reading about a boy with swimming frog powers. She has been engrossed in the Pokemon book - looking at all the names and powers and the 'levelling up' they can do. I like the phonetic spellings in it - and have been pointing them out to her how to read them. Mark had me buy a dictionary for her - there was a decent one for one dollar in the bookstore. I stocked up on some magazines for me and found a few other random books. She keeps asking me how many miles is it to Canada lately...as a joke when things get too wearing on her... there was a 25 cent book on Canada, so I bought it and put it on her desk. HA. The drawer pulls look pretty good! She picked pink ceramic ones that were not expensive. I think we'll do the other two drawers, too. I had her practice measuring and marking, (9 inches out from edge, 2.5 inches down - for later) then I drilled the holes and we saw if the screws fit through them. Then we talked about 'clockwise' turning to tighten. She fetched a hammer and a screwdriver when asked, and put them away at the end as well. It's nice to accomplish something useful as a team :) // -- Why a hammer? Because I had to tap one of them a bit to make it sit straight against the inside of the drawer - it just didn't want to play fair (the hole was probably drilled slightly at an angle) The tap worked and the screwdriver was to hold the screw in place so it didn't spin while the handle was put onto it. ----I had bought a sheet of mosaic glass tile in alternating shapes on clearance at work - we cut it apart, pulled off the mesh backing, and then began to use the tiles as a combination tangram and building material toy. She tired of making patterns quickly - and we began to build house-of-cards like structures that required patience and attention to balance and details. We talked about keeping your temper when things go wrong and trying again. She mentioned the tiles were a lot like dominos, but they didn't stand up - so she couldn't make domino ((cascades)). She then said she wanted to find a thing that was like the machine that does the things that do the other things to keep going - and wanted to know how to build one. I could see by her hands what she meant - Rube Goldberg.. and we played a screen game about that one day a few weeks ago. Then she combined it all - and asked if that was possible in Minecraft? ---She ended up making a huge flower structure that started deep underground and blossomed up into the world above.. she said she was working on it as a secret and I had to do something else. It was pretty cool - but then I spent another twenty minutes showing her how to do the water-->torch-->drop sand technique and challenging her to make six torches go out all at once. She did figure it out, and demonstrated it for Daddy again when he came back from the store. 11:30 - break, Daddy was back from the store, there was lunch, and Mom leaving to go to work. 1p - Planet Earth "Jungles" & "Shallow Seas"
We also found out where the seeds we ordered had come from - these are black and white dianthus and they come from Hong Kong, China. We found it on the map. She asked me where Guang Zhai? province was???? I don't know where she heard that, but there was something close to it on the map. The map is becoming very useful! I have a topographical one coming in the mail now so we can compare. We're still waiting on the car history/construction book. 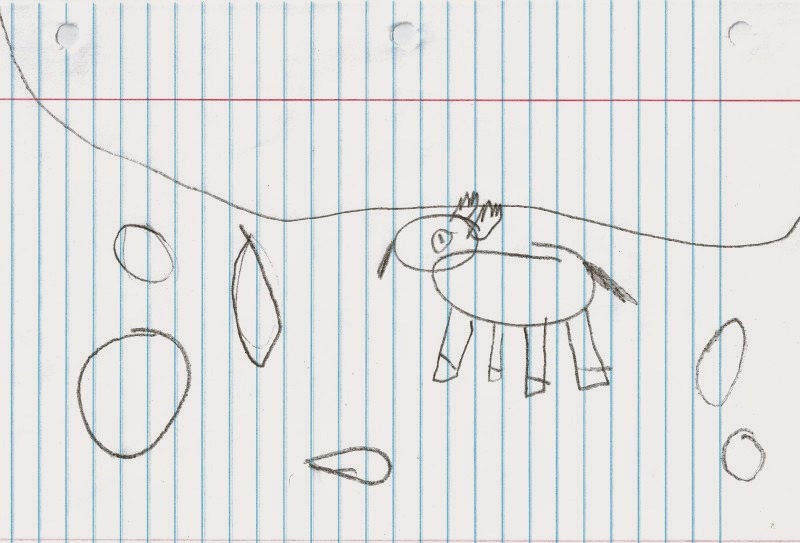 //Tomorrow I have told her we will test some spelling and some math - she has so many plans of her own, as well. She can check in on her eggs that need to hatch in Dragon City - because they are babies and they need us, she said as she brushed her teeth. We should check her greenhouse items (the petunias are coming up more, and Daddy bought us a new seed tray), and she mentioned something about using Google to check on a button that does something with powers in Goat Simulator - so she can research as school time and when it is afterschool time she can go try to find the things. After she does her tests and greenhouse I have promised a town trip. We can have some time at the library and maybe even some time at the playplace for PE if she has been in a good mood and done her things. Then it is a cold weekend ahead. //growing food, watching time, subtraction (up to four digits) and multiplication-as-repeated-addition exercises, both on paper and verbal - estimating, checking to see if she had enough food to fulfill needs, planning, using the interface and reading up on what to do next where etc. She learned h can stand for hour, m for minute, and k for 1000 of something. There was a bit of complaint when I was having her do a paper problem and she saw the food was harvestable and she didn't want to waste time doing the math...sarcasm and snippyness... I said we could be done right there if she wanted to act that way - she shaped up. //I told her because she did that so quickly (I had allotted fifteen minutes for one side of the paper, and she did both in ten and was LAUGHING about it, instead of grumping) she could freeplay while I washed my hair, and then when I got back I'd answer any questions if she had them. She told me she saw (name) and (name) dragons in the books and then saw them in someone else's habitats and knew them by their shadows. And - this was so exciting! //There is a pullout 3 page painting from one of our Nat'Geos that shows rainforest animals by shadow in a smaller graphic, then she finds the number for that silhouette and it tells her the name. She picked the python to look up more about today. She thought the carpet python was pretty, and noted that her friend is now in Costa Rica and several of those snakes live near there. Noted 'Central America' between North and South America, and Indonesia above Australia. 12.30p - pbskids - wordsuckeruppernator? I asked her and that was the game she said she was working on. Looks like it's part of the Electric Company gameset. --one of our petunias MAY be coming up, Esme noticed it and told me not to give up on them, we haven't waited patiently enough. We planted nasturtiums and pepper seeds in the radish containers and gave the pitiful radish strings to Kitty goat, who loved them immensely. 9:30 - Mom had to leave for work, she was still playing 'Pancake Falls Swamp - where you get eaten by pancakes' and making patterns in the oobleck - Daddy said they added food coloring and made a containment field (ziploc bag) before cleanup time. She would like to look more at the Bermuda Triangle for school one day this week. She is excited about the idea of going to a movie next Thursday. She had a lot of interest in the rainforest (South American and African comparison) pullouts in the Nat'Geo... and we could use that to help her research different animals. She is coming along with the 'We can look it up' and 'can you type it into Google' experiences...it used to take a lot more to get her to take a stab at looking it up because she is so afraid to spell it wrong -- and now that she has seen the auto complete she is more willing. //laundry now and a few little bits. 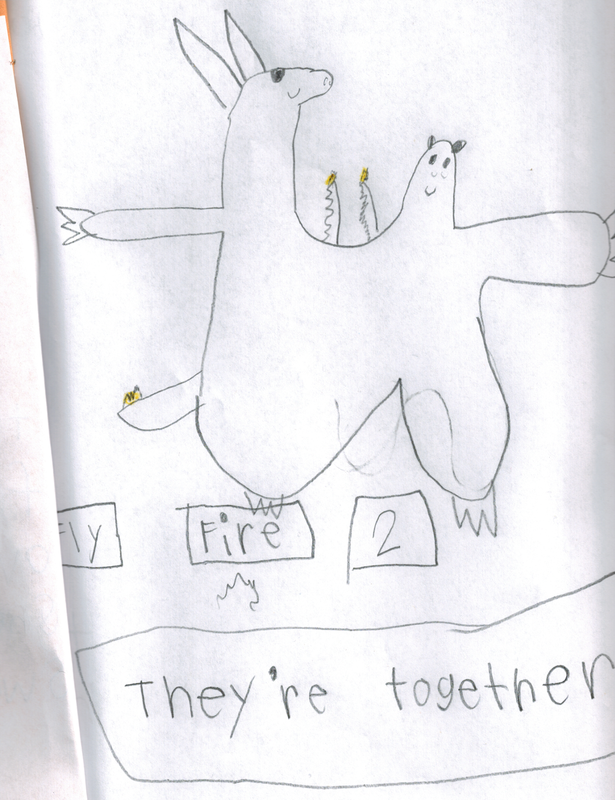 Esme wants to try to feed Minecraft cake to pigs, as seen in her poster. I've got to remember to look for 1987 NGs at the library this next time we go. There is a map of walruses in one of them that we didn't have. bits of note: I've made a few observations lately. Esme is much more 'grown-up' about some things than she was even last October (when we began homeschooling). It's not across the board, but it is noticeable and it has been creeping up on me lately that I needed to try to put some of them to words. However, spelling and writing are her least favorite things. But, I've seen her spelling improve when she doesn't know she's being watched (names in Minecraft, signs, notes she writes for herself)..and she is more willing to attempt to spell things phonetically than she was before. She throws some huge words around now that she doesn't always know what they mean - but they're there.. and she is gaining ability with them (magnificent and superstitious and pteranadon, today...) And her sense of humor is getting better. She is less 'lost' when it comes to sarcasm, jokes etc..
Last bit, her names and pretends are becoming some bit more interesting and using info from many places..her creative streak is coming into it's own. And she still does things that are very much like a seven year old little girl. She had a sweet little 'dress shop' made out of a book holder box, some dresses I had made for other dolls and her chosen favorite animal dolls to put the dresses on. Her rubber "Leaferella" frog was given a dress and getting some very special treatment (even a baby bottle). Her own fashion sense is coming along nicely - pairing her clothes and such in a less haphazard way - that is worthy of note, too...even if it isn't something she sees in either of us, it is a step to growing up. She made an awesome 'Flint Lockwood' type computer out of the bottom of her book box, drawing a screen and keys on it. She then put on her white 'lab coat' and told me her new pretend sister Sam Sparks was coming for a visit and they were going to do science! She said she can look up pretend things all day long on her new computer and real things on the computer upstairs with Daddy. Why do some schools feel like prisons? // Yes, if you had read our Homeschool Decision, this was half of our complaint about the local school district. School should not be like prison. School should have talking and playing somewhere in the day for six year olds - not constant lockdown and punishment for whatever the teacher decides is being punished today. ie: stand in your square, don't drop your pencil, etc etc.. They then tried to tell us those are the skills that she will need in her job someday. I think you're doing it wrong, especially at six. De-Schooling Me // Great article, especially about halfway through I started seeing the reasons we are homeschooling. Note: The best medicine - humor and laughter - is the best teaching method with this girl. She shuts down when something goes wrong, or she is wrong - perfectionism streak...trying to teach her to try again, laugh it off (if possible) and learn from mistakes. If something is funny or really really cool - she wants to learn about it and doesn't mind doing things related with it, as long as they really seem related to it. Bribery doesn't work too well...at least not for hurrying along - she is very in the moment when she is working on something. We've been talking about 'the fourth dimension' though, and thinking back in all of the time you saw something (photographic memory, making it an asset) and thinking with your brain what the future can be - because we make the future, and how to make it happen. She was skeptical about the idea when I brought it up a week or so ago (while looking for something at the supermarket that had moved) and now she is quoting it back to me and pointing out areas the skill is useful and how to use it. //Mom would fist-pump the air at this one if it continues to progress! My photog.mem has really become an asset in my work because I took the time to train it...it can still be annoying at times, too - but it really helps as well when I can quickly access orders and product locations in my 'mental file' instead of the computer one that takes more time. Chicken soup has become breakfast two days in a row, as Esme is trying to get/not get a cold. We wish it would hurry up and be Spring already. I was reading this excellent article Techies Hack Education by Homeschooling their Kids and it sounded a lot like our house. The banter later in the article was pure gold. We really are 'unschooling' but steering a little and making sure we cover the basics and track our time. It seems to be keeping her engaged, although she yearns for more peer interaction. Which, I am trying to get for her. If Spring can get here, if warm weather can get here, there will be more outdoors time and everyone will be happier. The puppy is settling himself in. Squeaker, our last Great Dane, is very lonely outside without his mother and sister. We are wondering if there is a way to rotate the dogs through the yard to spend time with him -- they are kind of thinking the same thing. Mark mentions he has seen (And I have, too.) the Catahoula crew rotating who stays at the fence edge and spends time with him and who is out hunting and patrolling. They know he needs someone, too - and are doing their best to see he gets it. She really wanted to do Cyberchase game with me and Khan math, but I had to go. --There was a short question and write-the-answers after this Mark showed me, and Esme did well. Writing is her weakest subject and she has been doing more of it lately without as much fuss. 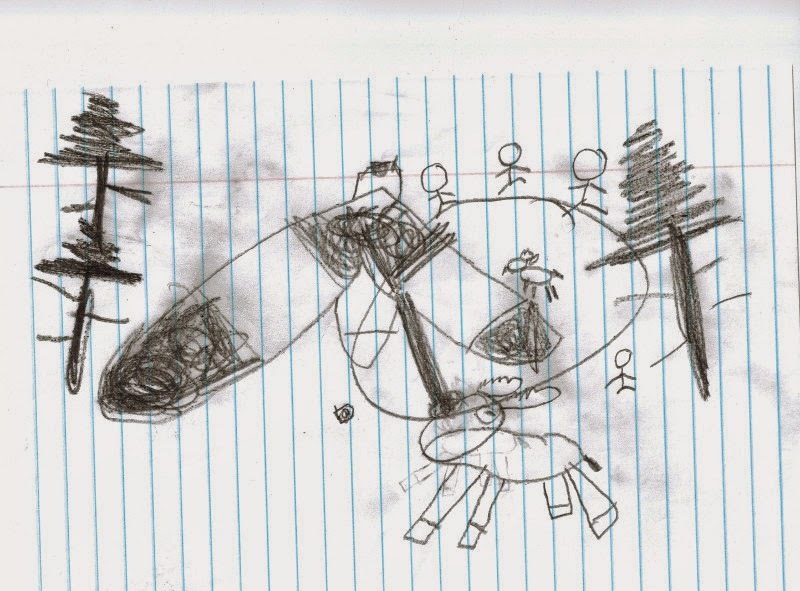 She drew things she liked out of Goat Simulator. 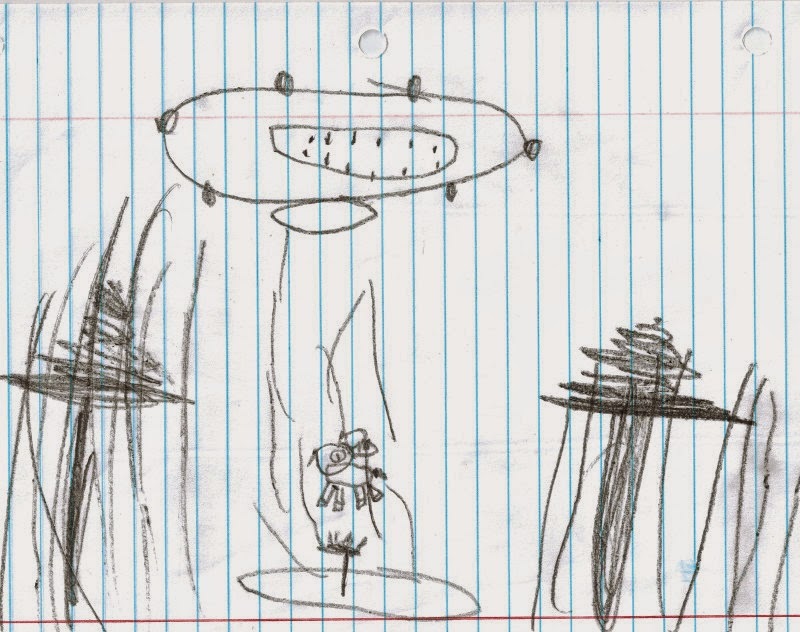 Her drawing is getting very good - she drew more than a dozen pages of different places in the game. I loved seeing her 'this is me out in Space' picture.. try to upload it later. 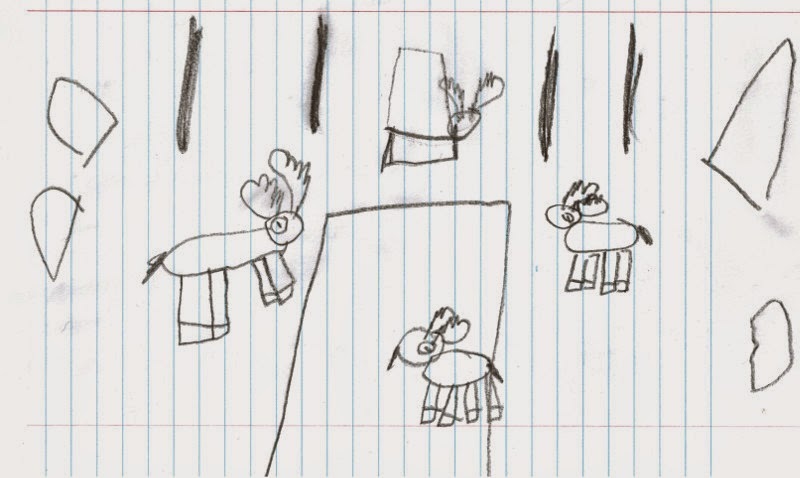 These are just SOME of her drawings of goat simulator.. This one made me laugh! This is me in space. And those are rocks. This is the hang glider over the forest, but you don't lick it - but if you did, it would look like this. Mark discovered that DeeDee, our other Great Dane, had died today. He buried her in the field next to Blaze, her sister from the same litter, who had died last week. He let Esme play more pbskids but didn't count anymore of it as school. When I came home from work I made Esme some dinner and then she was playing with Crazy Sand. Daddy and Esme picked me up at the store after work. We also remembered to buy kite stick dowels and 'utility macaroni' at the store for upcoming projects. She helped me make some cornbread for dinner tonight. He is settling in nicely to the dog crew. She had thought up some actual projects she wanted to do today. 9.15a - cleanup and reorganization of desk area -- so much grump during this! First I had her take Daddy's macaroni out of the macaroni and cheese box, and put it in a ziploc bag. Then we emptied the Fiori noodles into another bag. Then we found two clean containers and made sure the balance scale was balanced and even. I had her weigh out the same amount of Fiori as there had been macaroni for Daddy's cheese packet - so he could make it later, and then we could use the macaroni (which isn't as good) for projects and a few of the leftover Fiori for necklace making. She liked the balance scale, as usual. She chose nice colors and didn't get frustrated when things were hard.. which was good considering earlier. Then I had to go to work..and Daddy continued with more copywork and science docs. Esme told me about the zombie ants she saw in the episode, and also how the copywork is rotting her brain, no - it's not pratctice, she insists.. it is full of the boring. I insisted it has all the letters and we did it as kids. She said, yes, that is what Daddy said. And then she harrumphed at me and brushed her teeth for bed. She did highly reccommend the planet earth episode, and told me I should get it from Daddy and watch it before I went to bed. She also said the spaghetti she and Daddy made for dinner was very good. It's been a weekend, but between giving a few puppies away and going shopping I feel about the same as the rest of the week. Esme and I have had two conversations about her homeschooling - and how it will most likely continue over the next year. She was arguing hard the other day - and we cut her off finally to think over what we said. Today, I talked to her in town a bit more about it. I know she misses the specific kids she was friends with - even worries about them - but I am trying to have her see that the rest of the environment was just not right for her style of learning. In fact, although she doesn't remember it that way now - it was shutting down all the curiosity and questions in her. We are so glad to see those back - and to answer her questions when she has them (usually, within reason) - that I don't want to see her going back to rocking in her chair, angry at the world and then fighting her to bed and back awake every day of the week for something that just doesn't fit her. Just sitting there in the car she was full of questions - Why are the gauges dark and showing 'nones' right now? How does the car know when the electricity is on from the key to make the gauges know the gas tank is full or empty? Can she see those wires? Why does the air conditioner button go on or off even if the key wasn't in? etc etc...The other day she saw me sorting some beans out of my collection, and asked why. I told her there was a spot of green mold on this package and I didn't want it getting into anything else - so I was going to throw it out. She asked if we could keep it to 'do science' on it, and see if we could make it grow more mold. So, I've kept it aside in another jar - and we'll try to wet it and put it in a warm window next week to see what happens. She has all the curiosity we had as kids - which gets her in trouble sometimes, her brain is always moving.... Yet, I know she isn't entirely like we were as kids - too much has changed. There is now 24/7 computer access with internet, games at the touch of a finger, books are 'always here', not often fragile treasures to be discovered and perhaps never seen again... VCRs were just roaring up when I was a kid.. and it was amazing, not 'ordinary' to have things to watch over and over.... but the loneliness and not being around any other kids like you, even sometimes when you were in a swarm of kids... that rings with me. And that feeling of being alone, or worse - singled out - in a crowd, was worse than being alone in reality and having to make everything up in my head. She told me this morning she was still confused by her 'special eyes' that cannot see themselves but can see all the things she saw in the past - if she thinks about them. And the next minute she is discussing what her plans are for building something, or trying a new combination in a game she hadn't tried together - just to see if it does anything. She is just so many ages at once... and our school system isn't about cherishing and nurturing that - it is about stomping it into a mold instead. Maybe I am protecting her from too much there - maybe not. I tried to remind her again today about all of the reasons we are homeschooling, and the things she DOES get to do now that she couldn't when she spent 10 hours of her day at school and had an early bedtime to boot. She does like being able to do the greenhouse and building and science things - and meeting all the people at different stores and places. We talked about how the cold and wet weather has kept us from doing a lot of the fun things, park, lake, etc.. that were very fun for her last year. And how when it gets a little warmer again we can go to a farm again, make our garden, go to the lake often, run at parks for hours etc... and she will not feel so cooped up and miss her friends (who by the way HAVE grown and are doing their own things) from her class.